The people I work with are all foodies just like me. We think of every excuse under the sun to throw a potluck party. "What lovely weather we've been having! How about we celebrate with a potluck party?" or "We saved $20 on office supplies last month. Good job, team! Let's reward ourselves with a potluck party!" Ok, maybe I'm exaggerating but we did once jot everyone's birthday down on the giant whiteboard so we could tell when the next potluck party would be happening (not exaggerating). Another case in point: One of the ladies is leaving the company and this would be her last week with us. Needless to say, we planned a farewell potluck party in her honor to wish her well before she went on her merry way. However, she informed us that something came up and that she wouldn't be able to attend her own party. Well, we did what all serious foodies would do. We went ahead with the party today without her and happily savored every last bite on her behalf. Farewell or not, we've got to eat, right? 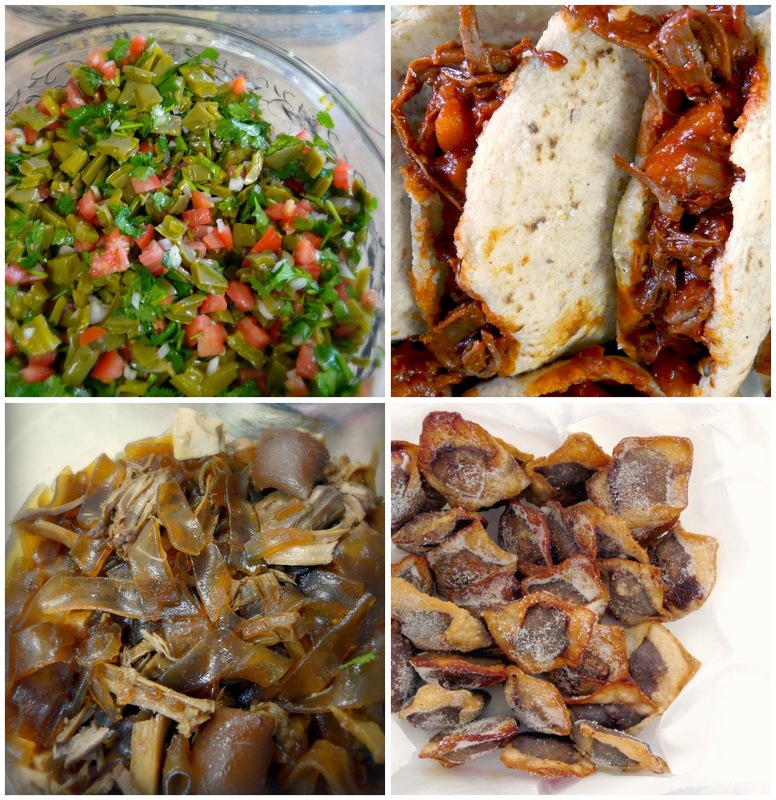 Refreshing cactus salad, delicious beef and potato gorditas, my fried chocolate marshmallow wontons and scrumptious glass noodles with stewed pork (粉丝红烧肉) -- a Northern China dish. 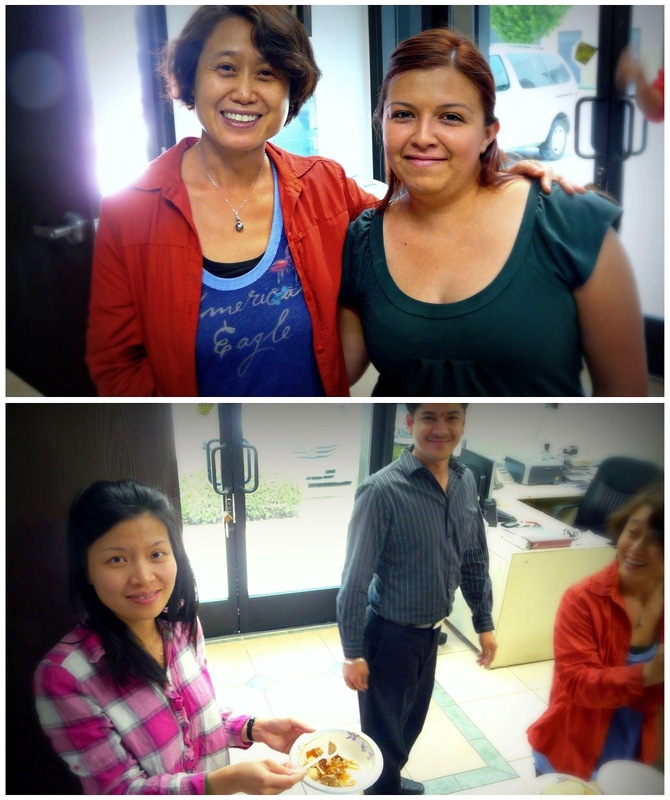 Top photo: Sunny and Diana, the lovely chefs who brought the noodle dish, the cactus salad and gorditas. / Bottom photo: Tiffany, on left, the newest addition to the company (who quickly became the new honoree of the potluck) and John who was just there to help us eat. Since it appeared that no one else would be bringing dessert, I thought I would do the honors. I wanted something quick and easy yet be absolutely sinful. Fried chocolate wontons immediately came to mind. I went one step further by adding marshmallows because I was hoping that the wontons would taste somewhat like S'mores but the marshmallows didn't quite make that happen. What they did do was make the chocolate mixture ultra luscious and silky. It was a big hit and that's all that matters. Semi-sweet chocolate chips and mini marshmallows for the filling. Melt the butter in a pot over medium-low heat. Add the marshmallows and stir constantly until the marshmallows have melted. Add the cream next. Pour the mixture over the chocolate chips. The mixture should be hot enough to melt the chocolate. Using a whisk, stir everything together until the chocolate has melted and everything is well mixed. You should get a creamy and thick chocolate mixture. Pop the mixture into the fridge for about 20 minutes to chill and thicken a little more. Mix the hot marshmallow mixture (on left) with the chocolate chips until you get a thick creamy filling (on right). To prepare the wontons, place a teaspoon of chocolate filling in the center of the wrapper. Brush the edges of the wrapper with the egg mixture and fold over to form a triangle. Brush the bottom corners with more egg and fold in to create the shape of an envelope. Repeat until all wontons have been made. Pop them back in the freezer to chill for another 30 minutes. Fill wontons with about a teaspoon of chocolate filling. Pour about 1/2 inch of vegetable oil into a frying pan and heat to about 300 degrees. Gently slide the wontons into the pan and fry over medium heat until golden brown on both sides. Remove and drain on a wire rack or paper towels. Sprinkle with sugar and serve hot alongside your favorite ice cream. Best served with ice cream.